Here are two freebie, outdoor performances coming up this weekend worth every penny. We’re talking Captain Kirk and Madonna. Outside. Free. UPDATE: Blame my planning ahead mode. As pointed out in comments, Madonna movie is NEXT Friday. First, the third in Three Dollar Bill Cinema’s outdoor film series in Cal Anderson park features the Madonna star vehicle, Desperately Seeking Susan. CHS is a happy co-sponsor. Movie starts when it gets dark so plan for 9ish. A Madonna look-alike contest will keep you entertained before the show. Captain Kirk is the new Hamlet in Hello Earth’s Outdoor Trek. 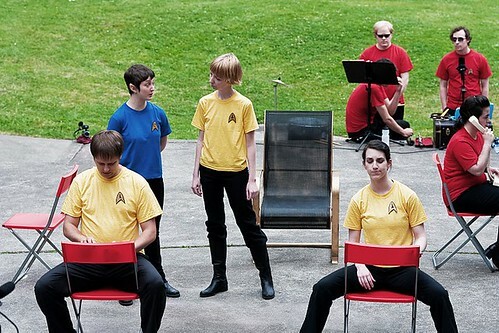 Outdoor Trek: “The Naked Time” is a live, free performance, dramatizing an episode featuring the original crack crew of the Starship Enterprise. Saturday at 7 PM and Sunday at 2 PM in Central District’s Dr. Blanche Lavizzo Park at 2100 S Jackson St.
For bonus park freebies, check out Thursday night’s Volunteer Park Conservatory community luau and Saturday’s Team USA vs. Team Brasil benefit match-up for Bahiastreet.org. Desperately Seeking Susan is next Friday, Aug 13, not tomorrow! Thanks. I’ve been planning editorial calendar all day so am future focused! Sorry about the mistake. The Facebook event invite and Three Dollar Bill page both say that Desperately Seeking Susan is on Friday 8/13, not this Friday 8/6. Susan and her life is Aug 13th.